My son has always been a “hip” baby. He has loved being carried around since the day he was born. Maybe it’s his enjoyment of watching his surroundings from a different perspective other than the ground, or bouncer, but whatever it is he loves being carried. Now this insatiable need was fine when he weighed 10lbs, but now at 10 months and 22lbs it has gotten to be quite…heavy. Enter the Baby Nari Baby Hip Hugger. I had the great opportunity of trying out the Baby Hip Hugger with my son and I am so amazed at the difference! 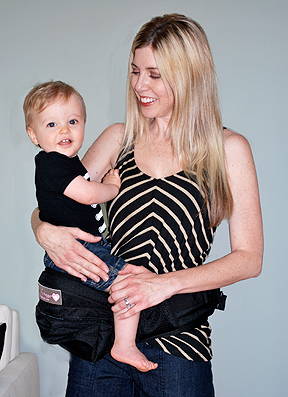 The Baby Hip Hugger is worn around your waist by a Velcro closure and looks like a fanny pack. This pack has a built-in reinforcement that the child can then sit on. It’s like a fanny pack on steroids. Add to that some zippered pockets with space for keys, phone, or whatever and it becomes a carrier that has multi functions- I love that! When I placed my son on the carrier seat, I couldn’t believe how much easier it was to hold him. It was like a giant weight, literally, had been lifted off my shoulders, arms and back. I felt like I could carry him around all day and have no issues at all. In fact, I found myself doing just that. I was walking around the house doing my usually routine all while carrying him around with me and never once feeling that usual arm and back fatigue. He seemed to really like it too. He was relaxed and comfortable, and he wasn’t constantly being shifted to get in a better position or switched back and forth to give my arms a break. I loved the ease of the Baby Hip Hugger and I’m excited to use it on a regular basis. Also, now when we go to the zoo or other sight-seeing activities and my son wants to get out the stroller and be carried around, I can put on the Hip Hugger and have a great time holding him. This really is a great product and I’m so happy to have one for my “hip” baby. « Who doesn’t love pinwheels?